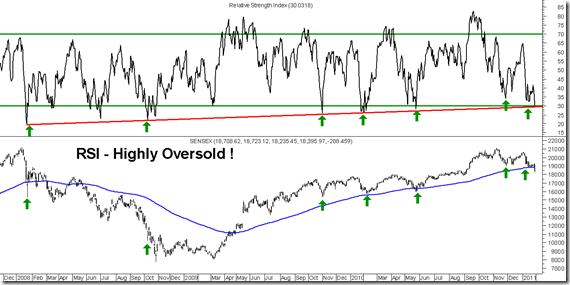 RSI seems highly oversold equivalent to sentimental lows seen before. 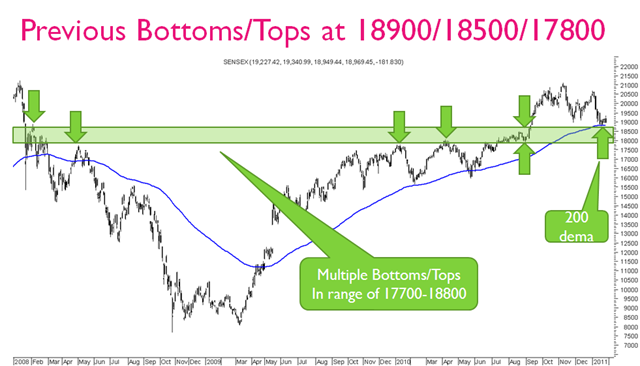 Major Bottoms/Tops in the band of 17800/18500 are reasons to warrant at least a bounce if not a turnaround. In the last few weeks the view has been to keep cash. The view since 19900/19000 break was to go to very high cash levels. FInally the index has come into a low risk high reward scenario. The medium term trend decider is 17800 and current zones of 18000-18300 give a low risk on downsides which is roughly 200-400 points we can see a bounce back to 19000-19500 on the minimum end and on an optimistic note we may bottom out also. The view is pretty clear to deploy cash and also risky traders can build index positions with a view of bounce back to 5650-5700. OUR large cap bets continue to remain SBI , Reliance , ICICI Bank and Hindalco. We may look into midcaps once the market stabilizes at current levels. 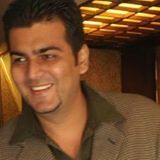 I ant to select mid cap scrip for five year horizone. What is your view on DPTL ? Technically no views on above as they continue to be in downtrend. Nalco has comeup with good results and announcement on Bonus, is it a good pick for short term? Is it time to sell some 5400 puts? How much more do you think nifty may fall before bouncing back to 5600?